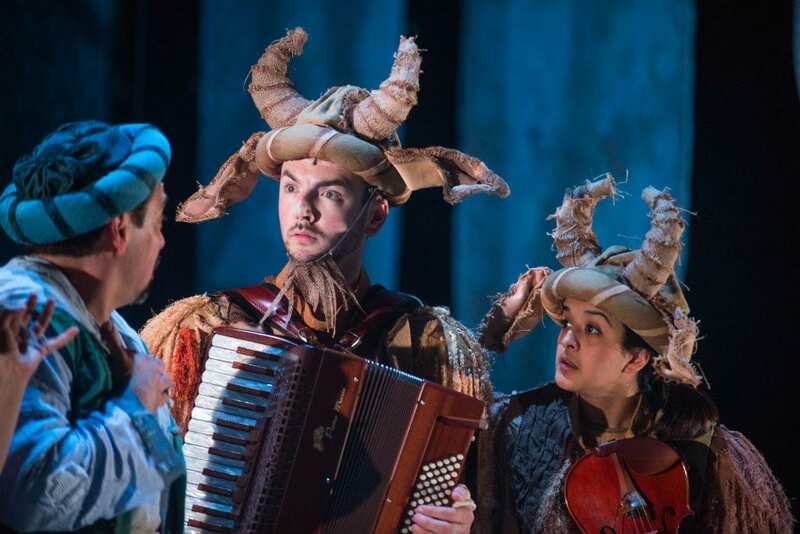 The stories within stories within The Arabian Nights is an immensely appealing theatrical concept, offering a wealth of opportunities to directors and performers alike. The play typically focusses on Scheherazade, a young woman who must marry a despotic Sultan, only to be executed the following morning. However, by telling him a succession of stories that never quite finish the night they are started, she prolongs her life and eventually wins her freedom. In this version, at a Lyceum sparkling like the very biggest Christmas bauble, writer Suhayla El-Bushra has subtly altered the power balance of the tale. Her Scheherazade (Rehanna MacDonald) is the wild daughter of a storyteller (Neshla Caplan) locked up by the wicked, story-hating Sultan (Nicholas Karimi). Scheherazade goes to rescue her mother, and entrances the Sultan so much with her stories that he releases his prisoners and loosens his tyrannical grip. Although it is the Sultan who has the power, this is a story entirely driven by and about Scheherazade. 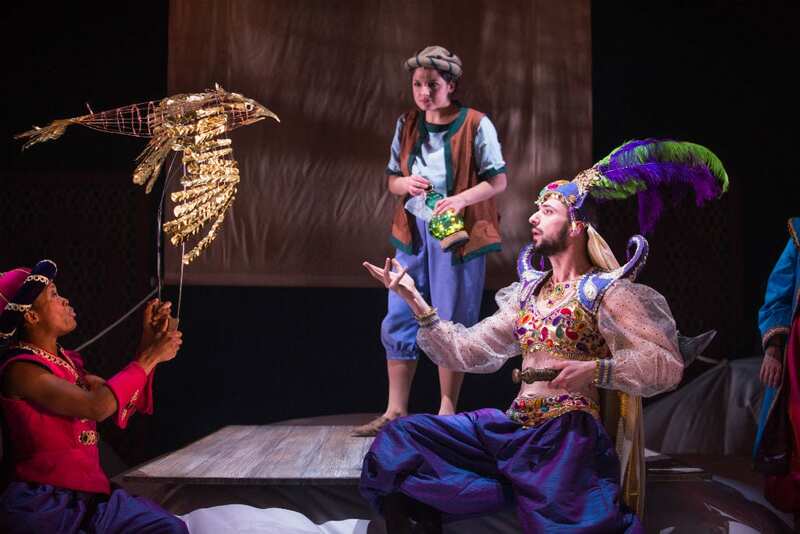 By removing the potentially aggressive sexual politics of the traditional way of telling The Arabian Nights, El-Bushra has made it family friendly and gender balanced. She also resists the urge to make too much of the Sultan’s potential father-figure nature, instead focussing on the love and support shared by Scheherazade and her mother. 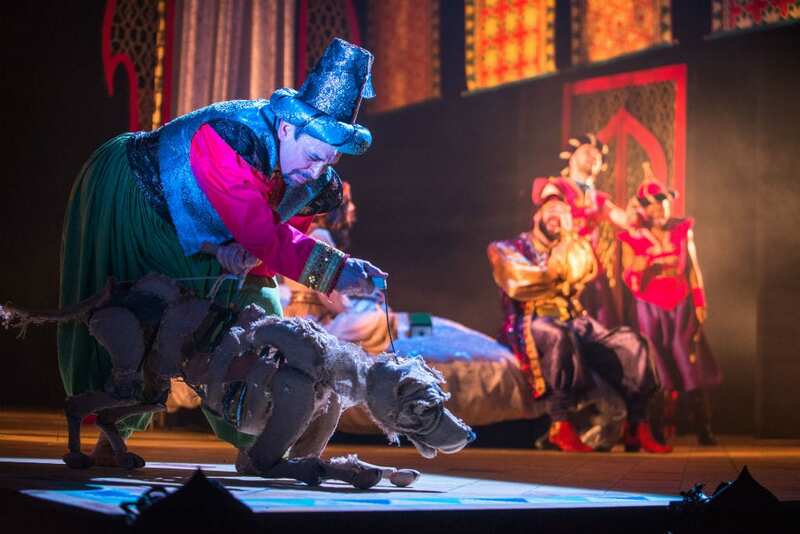 Joe Douglas’ production delivers pretty much everything one would expect from a Christmas performance of The Arabian Nights. There’s a dose of audience participation, two men in drag and a healthy amount of fart jokes, which might get a little wearing for the parents but which seem to be enjoyed no end by the children. In amongst the standard elements are some genuinely brilliant props and pieces of direction. A sheet of blue silk becomes the most evocative rippling sea and a whole, rambling palace is successfully conjured up with just a few Arabic latticework panels. Best of all are the two puppet dogs, skilfully manipulated by Taryam Boyd and Tim Licata, which are raggedly beautiful on stage and utterly enrapturing in the aisles during the interval. It’s a shame that not everything comes up to these high standards. The songs are often largely incomprehensible due to the volume of the music and, while no-one is expecting Pavarotti, too much of the singing falls very flat. The pace of the storytelling also leaves a little to be desired, with some stories rushed through and others overstaying their welcome. The acting is solid, if unspectacular, with MacDonald’s Scheherazade an appropriately spiky stand-out. Aside from MacDonald and Karimi, all of the performers play a wealth of characters, slipping from one to another using anything from a headscarf to an elaborate costume made out of socks. Brian James O’Sullivan does an excellent line in wry observation and forms a fantastically funny duo of goats with Humera Syed. 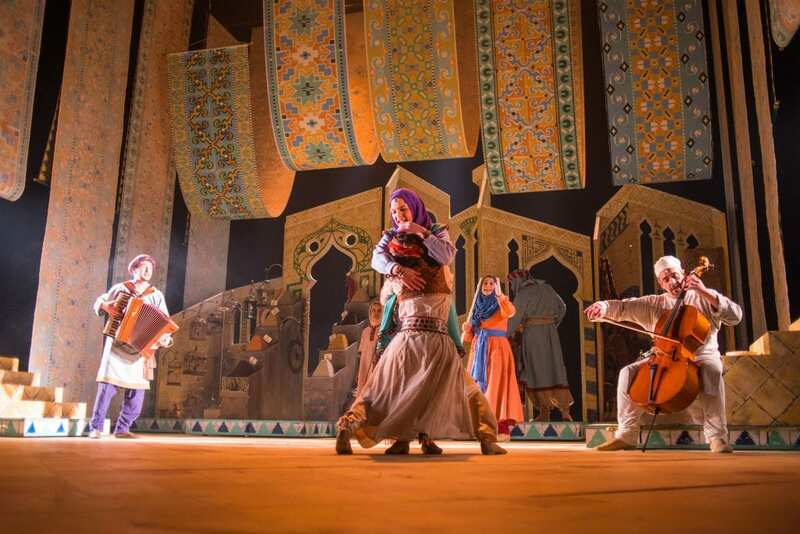 The Arabian Nights is undoubtedly a fun night out, and one that has a number of positive messages – the power of stories, the strength of women and the benefits of unity and inclusion all strike home strongly in these divided and divisive times. There might not be a great deal in this production for adults, but if you bring the kids and wind your sense of humour out a couple of notches, you’ll not be disappointed.